I am back with another Dapper Denim Bloom card. I am in love with this new color! Randomly stamp big rose image on whisper white piece in dapper denim ink. Highlight flower image with Wink of Stella. Adhere to Dapper Denim piece. Wrap Flirty Flamingo ribbon around dapper denim piece and tie a knot. Attach to the card front with dimensionals. Stamp sentiment in in dapper denim ink on a scrap piece of whisper white. Randomly stamp small flower in Flirty Flamingo. Punch with 1 3/8” circle punch. 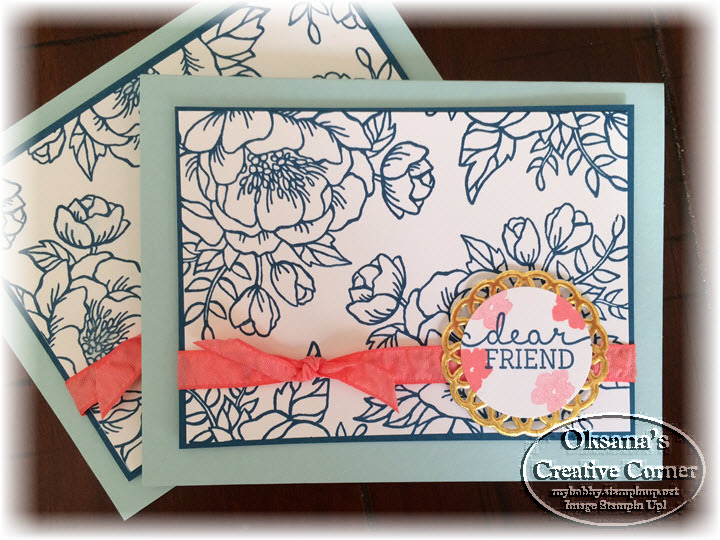 Adhere stamped circle to the small doily. Add doily with dimensionals over the ribbon on left side. Try in different color. What do you think will be a good one?